With the advent in 1997 of TIPS (Treasury Inflation Protected Securities), markets received a long-desired, market-based measure of real yields. 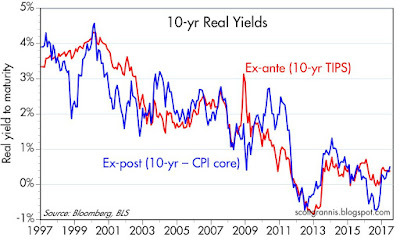 Prior to the launch of TIPS, real yields could only be observed ex post, by subtracting inflation from nominal yields. With TIPS, we know today the risk-free real yields that investors expect to receive in the future—a notable addition to both market knowledge and to investor's portfolios. Moreover, TIPS are quite liquid and abundant: with $1.24 trillion of marketable TIPS outstanding, representing 9% of outstanding marketable Treasury debt, their real yield to maturity—a function of their market price—is a valid and valuable indicator which has a variety of uses, as discussed below. 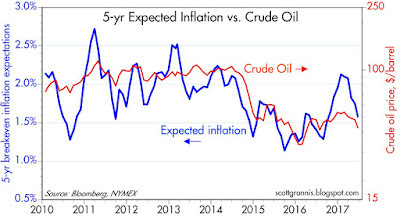 As the chart above shows, TIPS give us direct insight into the market's inflation expectations. Subtracting the real yield on 5-yr TIPS (blue line) from the nominal yield on 5-yr Treasuries tells us the market's implied inflation forecast, which today is 1.6% (i.e., the market expects the CPI to average 1.6% over the next 5 years). Although this is a bit below the Fed's professed target of 2% or so, it is very much within the range of historical experience, and nothing to be concerned about. 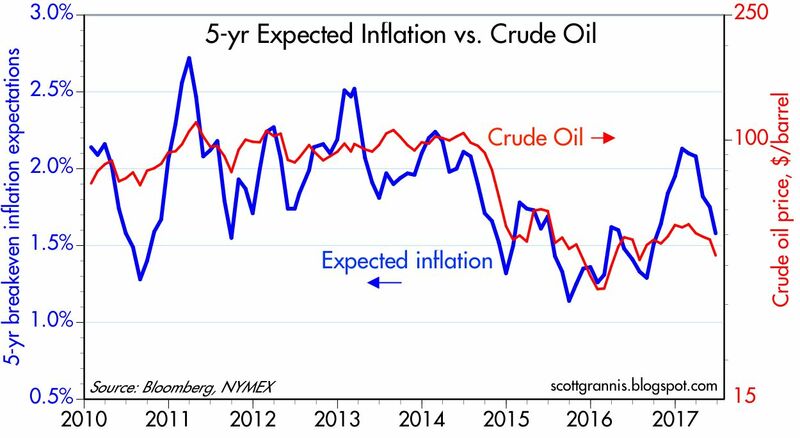 As the chart above suggests, the recent decline in inflation expectations is quite likely due to the recent decline in oil prices, not to any change in Fed policy. As the chart above suggests, the real yield on TIPS also gives us insight into the market's expectations for real economic growth. 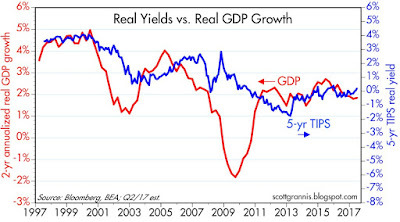 Real yields on 5-yr TIPS have generally tracked the economy's trend growth rate for the past two decades. Real yields have traded in a narrow and relatively stable range (but with a modest upward trend) for the past four years, and real GDP growth has averaged about 2% over this same period. When real growth averaged over 4% in the late 1990s, real yields on TIPS were just under 4%. That risk free real yields on TIPS should tend to be somewhat less than the real growth of the economy should come as no surprise. The best investors can hope for from the broad market on average is whatever real growth happens to be, whereas TIPS guarantee a real rate of return ex-ante. A bird in the hand should always be worth more (yield less) than two in the bush. 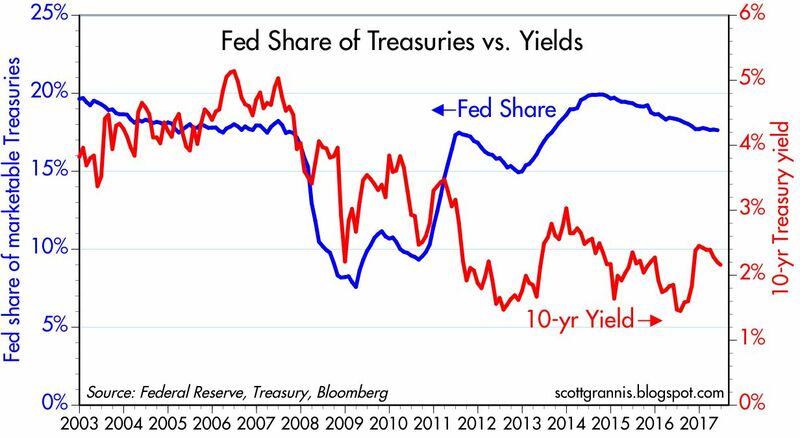 Skeptics might object that TIPS and Treasury prices have been distorted by massive QE-related Fed purchases. 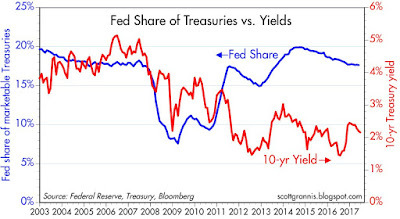 But the chart above, which compares the Fed's share of marketable Treasuries to their yield, shows little if any reliable correlation between the two. Today the Fed owns just under 18% of outstanding marketable Treasury debt, and that is about the same share as they held in the pre-2007 period—yet yields today are less than half what they were back then. The Fed currently holds about 9% of outstanding marketable TIPS, so Fed purchases of TIPS have had even less impact on the TIPS market than on the Treasury market. 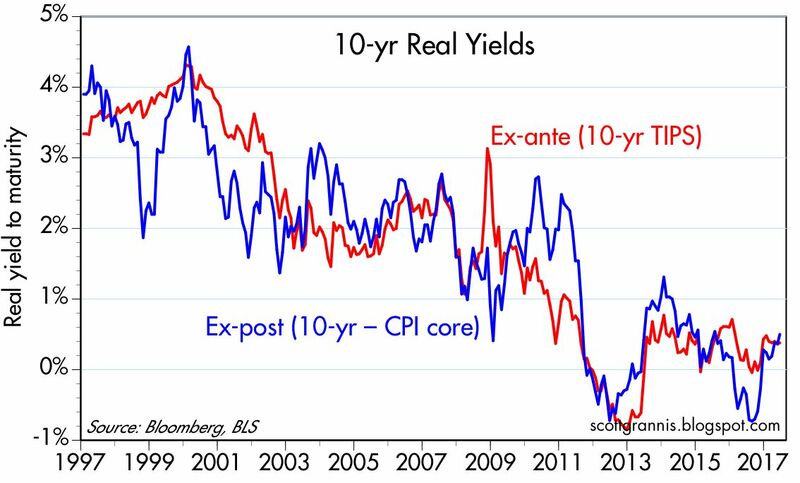 Not surprisingly, the real yield on TIPS today is heavily influenced by ex-post real yields on Treasuries, as the chart above shows. 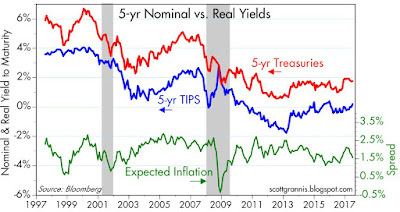 Fed purchases of TIPS, in other words, are not distorting the real yields on TIPS today. Market-driven real yields are grounded in observable real yields over recent history. 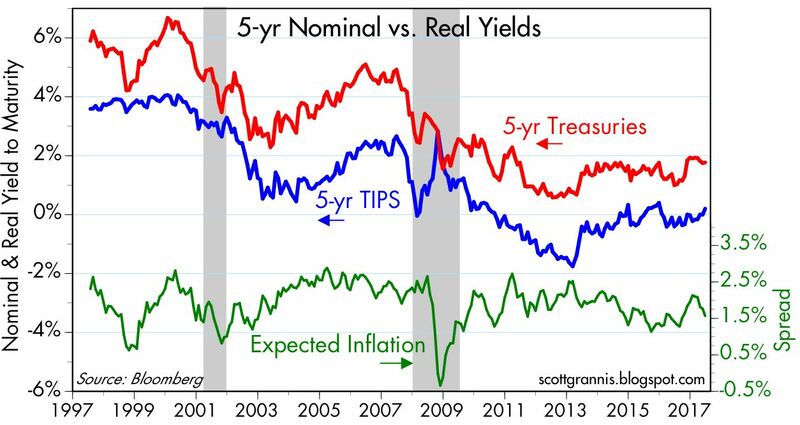 And the difference between Treasury and TIPS yields (expected inflation) is very much in line with historical inflation. Again, there is no evidence to suggest that the Fed or the market is distorting the prices or the message of TIPS and Treasuries. Real yields on 5-yr TIPS are by definition the market's expectation for what the real yield on the Fed's fund rate target will average over the next 5 years. There's an arbitrage that makes this work: you can invest in the Fed funds market for five years or you can buy 5-yr TIPS; in the presence of liquid markets it is reasonable to think that the expected real yield of both strategies is approximately equal. The Fed makes much of its nominal interest rate target, but it is the real yield on the funds rate that is the most important, and it plays a key role in the Fed's deliberations. Low nominal yields sound like "easy" money, but money is really easy only when real borrowing costs are negative, as has been the case throughout the current business cycle expansion. 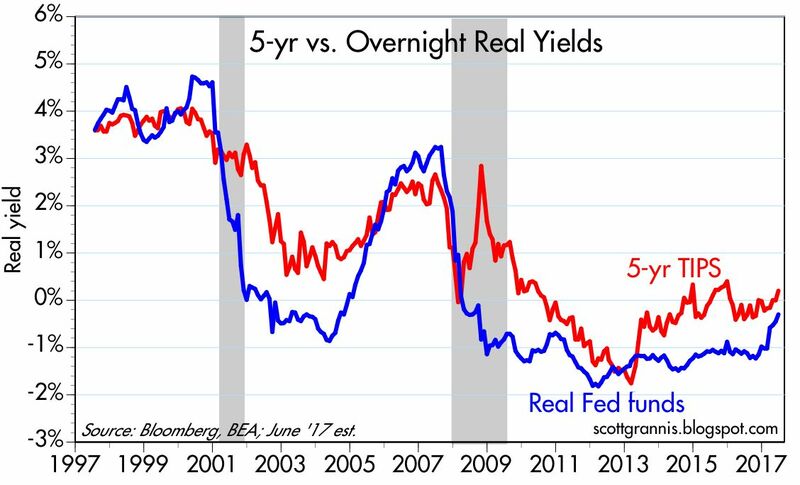 Real overnight yields are now rising, and beginning to be positive in real terms. That is fully consistent with the Fed's belief that the real equilibrium funds rate is rising as well, since the economy is enjoying improving economic fundamentals (e.g., a low rate of unemployment, steady jobs growth, improving confidence, low implied volatility, low and stable inflation, and reduced regulatory burdens). 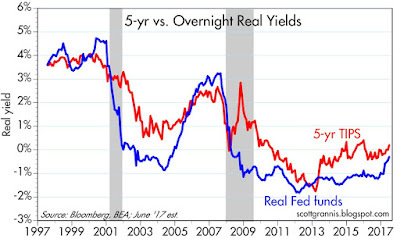 The current real yield on 5-yr TIPS strongly suggests that the market is expecting the Fed to continue to increase short-term real and nominal rates in coming years, but not by very much. In fact, the market currently expects the Fed to raise its target rate only twice over the next 18 months. 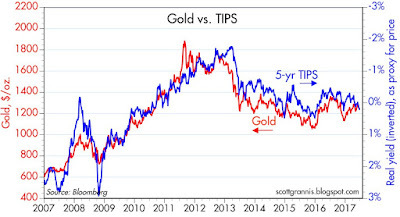 It's also worth noting that the prices of 5-yr TIPS (as proxied in the chart above by using the inverse of their real yield) have been positively correlated with gold prices over the past 10 years or so. This is rather remarkable, given that these two assets are fundamentally different in almost every respect. The one characteristic they share, I would argue, is that both are "safe havens" of a sort. Gold protects against all sorts of risks to one's purchasing power, and TIPS protect against the ravages of inflation of a monetary origin. One other thing that we can deduce from this analysis is that there is little if any evidence that the market is overly optimistic about the prospects for US growth. Thus, if Trump and Congress manage to deliver serious tax and regulatory reform, then I would expect to see much higher real yields, much lower gold prices, and a stronger stock market. I wonder about this. If the market sets interest rates, then rates are never "easy" or "hard." They just are what they are. If the world is generating "gluts" of capital, then we should see "low" interest rates, by historical standards. But today's rates may be the new norm, and so only (ahem) older people (including me!) perceive them as "low." Negative real interest rates may become the norm, as the market tries to signal that there is a "glut" of savings. However, the world has many "forced" savings plans, such as sovereign wealth funds, state pension plans, required insurance (premiums are invested) and large parts of the world where people must save for retirement regardless of current interest rates. Whether savers are free in Red China is whole 'nother question, and they are 1.3 billion people. The world has plenty of capital. As always, gold is a funny one. Twice in my lifetime gold has utterly failed to keep its value, collapsing from 1980 to 2000, and then again from nearly $1,900 in 2011 to about $1,200 now. A graph of the real value of gold from 1980 to present looks like a roller-coaster trip on LSD and mostly downhill. Yet everyday you see bloggers extolling gold as a preserve of value. Well, that is the nice thing about macroeconomics and investing, No one is ever wrong and some ideas never die. I had not realized this, but commodities are down this year by 8.7%, or so say the Bloomberg guys. There are other indices. Bloomberg's commodity index you cite is worthless, overly influenced by oil prices and the pricing of futures contracts. It has been falling for the past six years. I much prefer commodity indices based on market prices and which exclude oil prices (because they are far more volatile than most commodity prices and thus tend to dominated indices that include oil). Look instead to the CRB indices, in particular the Raw Industrials index. It is up 25% in the past 18 months. I think all the indices are useful, but probably for different purposes. The above index is fairly broad, and shows commodities generally falling the last five years, fairly steadily. The all-time peak was back in July 2008. Been tough to make money in commodities for a long time. There was such a huge run-up in prices pre-2008 that supplies will be lush for a while. Also, as many people have noted, the long-term price for any physical good, commodity or manufactured, is probably down. Man is inventive. If markets are free, commodities will get even cheaper. they were dirt cheap and paying divis..
GLD was trading at 91.31 on 1/1/09 and is now trading at 118.77 for an acr of 2.8%, slightly more than rate of inflation. Gold is a dumb investment. It's a ROCK! No dividend and no "wind behind the sails" such as incremental growth due to GDP expansion. Never understood it and I contend that most people don't either otherwise would trade much lower. Re commodity indices: There are two types, and they are fundamentally different. 1) indices that are based on the spot prices of commodities, and 2) indices that reflect the results of investing in commodity futures. 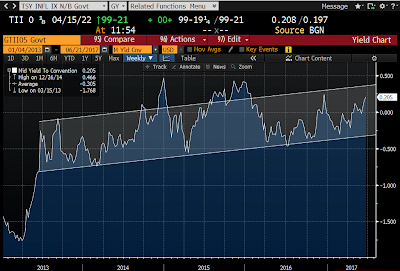 The CRB indices are the best example of the former, and they show that commodity prices have been rising in the past year or so. The Bloomberg and SPIN indices are examples of the latter, and they show that investing in commodities via futures has been a losing proposition. I always refer to indices that are based on spot commodity prices, because I think they provide insights into the global economy. Great explanation in commodity indices. We may see some global growth thanks to the PBoC and the Bank of Japan. The Fed tightening the monetary noose---the SF Fed recently opined the U.S. is "beyond full employment." "GM's inventory has officially hit a 10-year high. as of June 30, the most since June 2007.
for clues that the next recovery is coming. Employment data are not leading indicators. Employment often goes up in the first month of a recession. but real time employment data do not predict recessions.